On 2/13/09 (Friday night) - 2/17/09 (Tuesday morning) several of us met in Reno, Nevada (the Lake Tahoe area) to go skiing. Here is who showed up: Me (Brian Wilson), Mike Chow, Paul Wieneke, Brady Nilsen, Brian Wohletz. Below are some pictures from the trip. Click on any picture to get a HUGE version of that photo. 2/13/09 - Reno, Nevada skiing Squaw Valley and Mt Rose (The web page you are reading). Ok, on to the pictures! 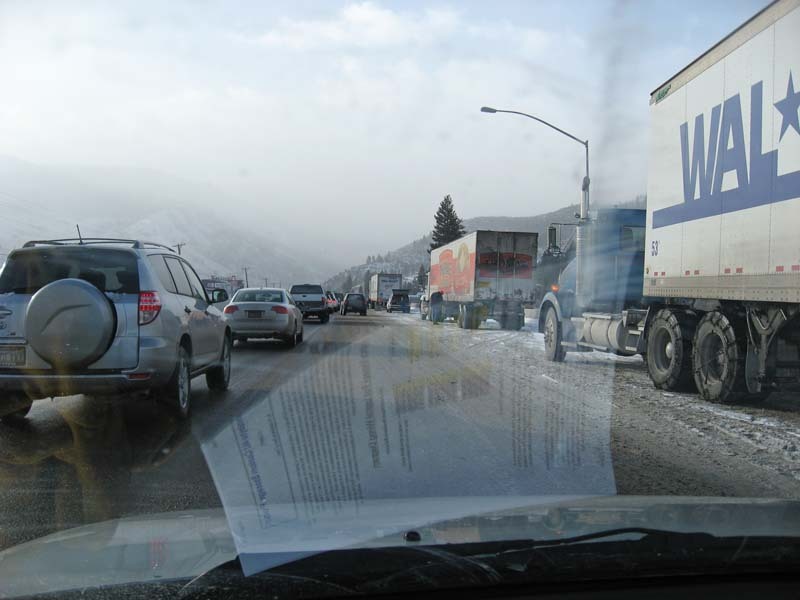 Below is an action picture taken while driving to Squaw Valley on Saturday morning (2/14/09) from where we stayed in Reno, Nevada. The important things to notice are the tire chains on the semi trucks to the right because there is so much snow! 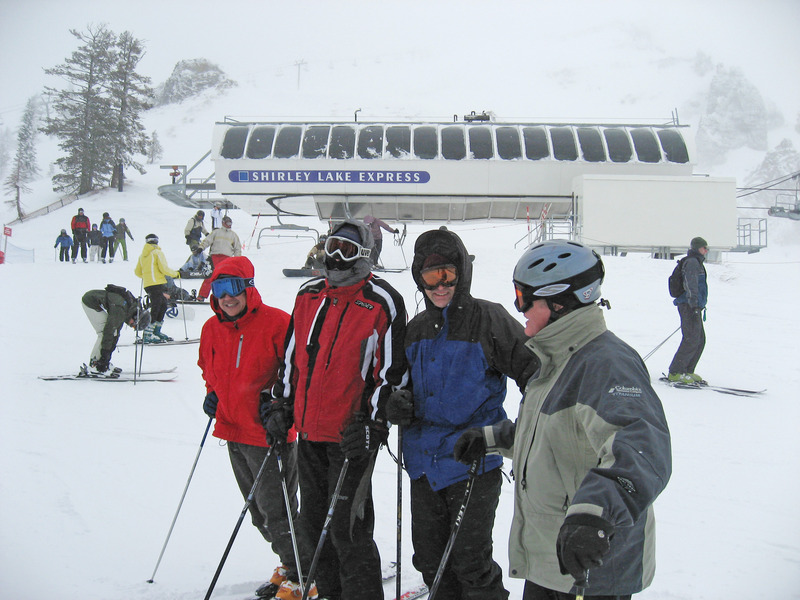 Here at the famous "Shirley Lake" lift at Squaw Valley from left to right is Mike Chow, Brian Wohletz (bundled up with no skin showing :-), Brady Nilsen with a big smile, and Paul Wieneke on the far right. That's a complete roll call from this trip if you include me (Brian Wilson) behind the camera. 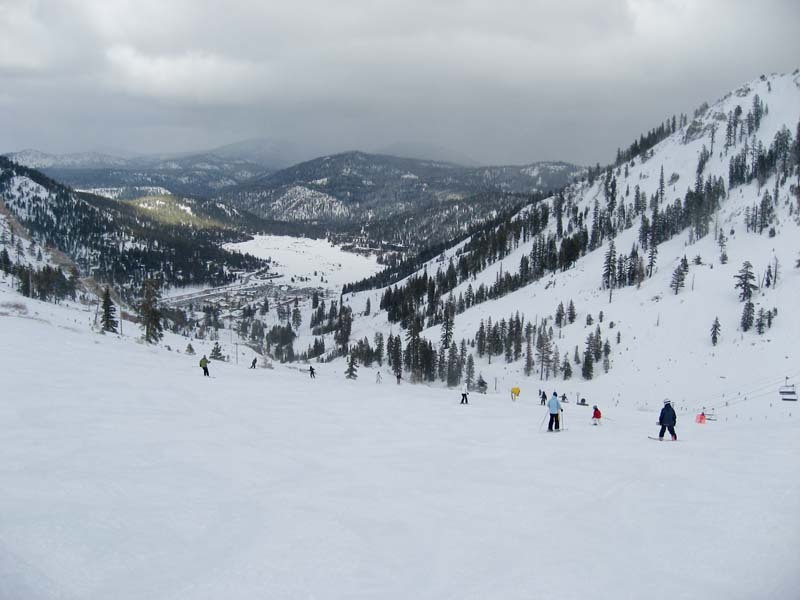 Below is Squaw Village from the slope above the Resort at Squaw Creek. Notice the nice fresh snow! 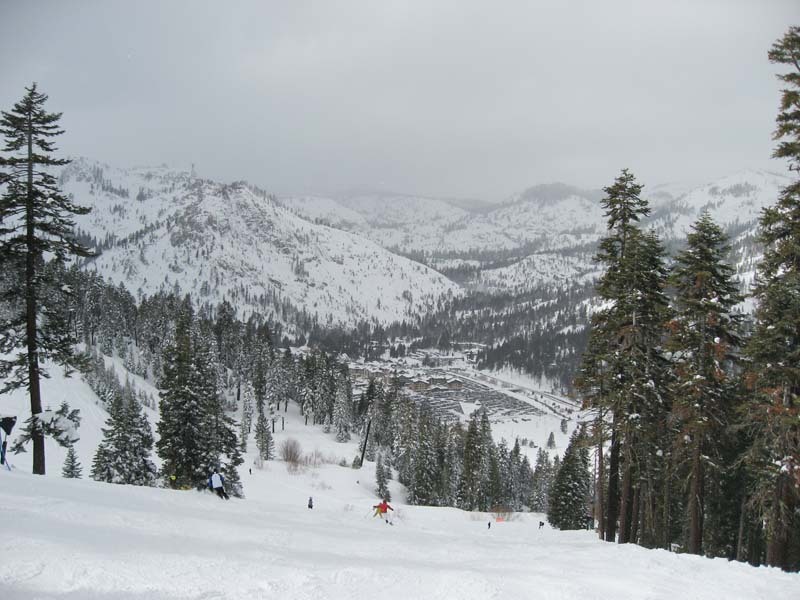 A picture looking down at the base area from the "Mountain Run" at Squaw Valley. Later at the end of the day or the next day, here is the view from the 11th floor of Harrah's Casino in Reno, Nevada. This is the view out our room's window. The last day of skiing we did on Monday, 2/16/09. Mike and Paul headed home the day before, so we're down to the cool people of Brady Nilsen, and Brian Wohletz (pictured below) and myself (Brian Wilson). 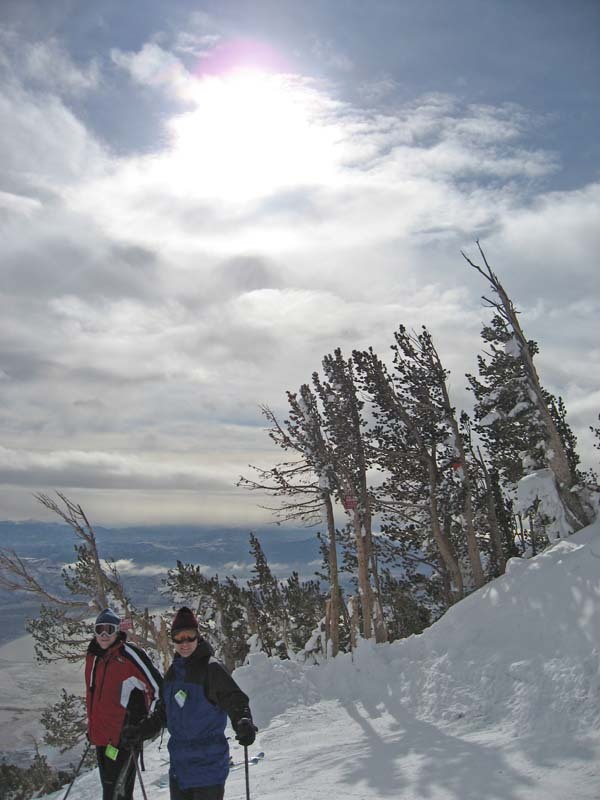 We skiing this day at Mt Rose, which is right outside of Reno, Nevada. 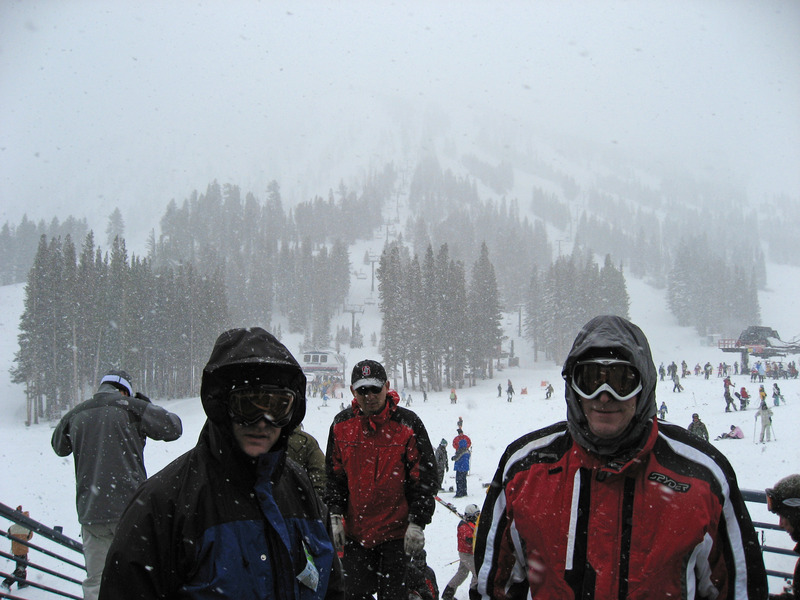 Below you see us preparing out of the world's best snow car (Nissan Sentra) in the Mt Rose parking lot. Below is a Mt Rose lift map. Click on the image below for a more readable, larger copy. Here is proof I was along on the trip. :-) I'm on the left in blue, and that's Brian Wohletz to the right in red. Brady took the picture. In the morning we had big fresh snow and SUNSHINE poked through. We took the picture below to show the shadows on the snow from the sunshine! It was very pretty. 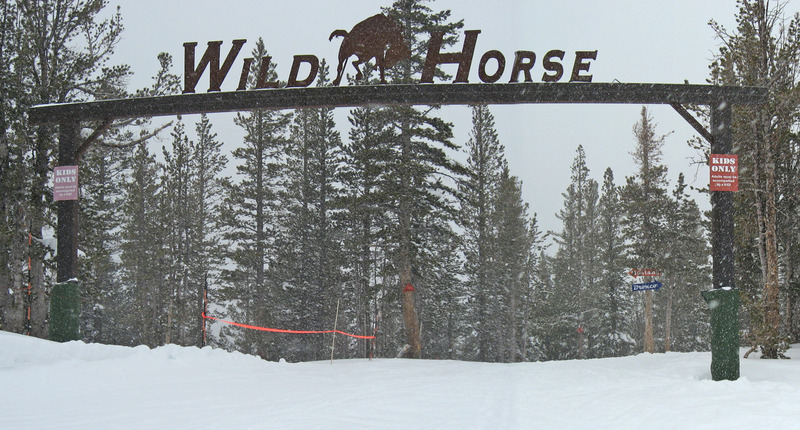 Lots and lots of snow at Mt Rose ski area! It was a big storm in the area over the time we were there. 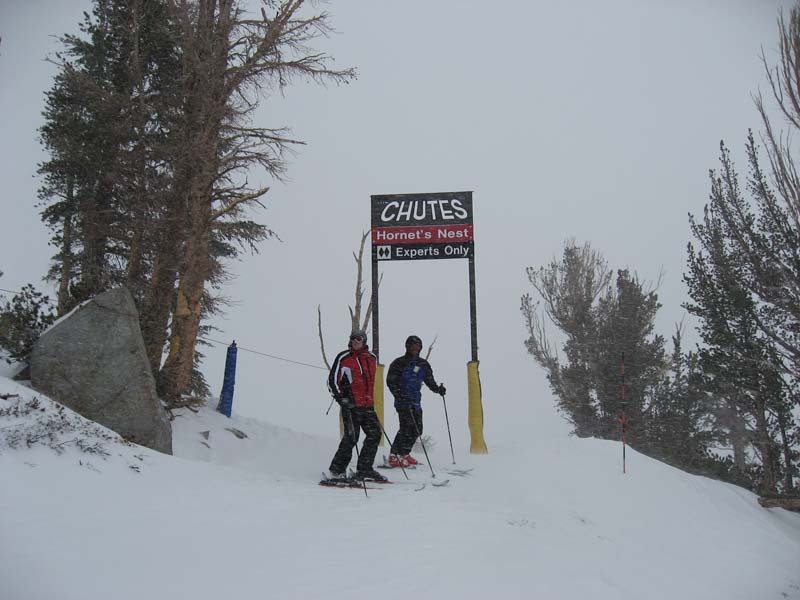 Brian Wohletz and Brady standing in the "Beehive" chute which is part of the famous "Mt Rose Chutes". 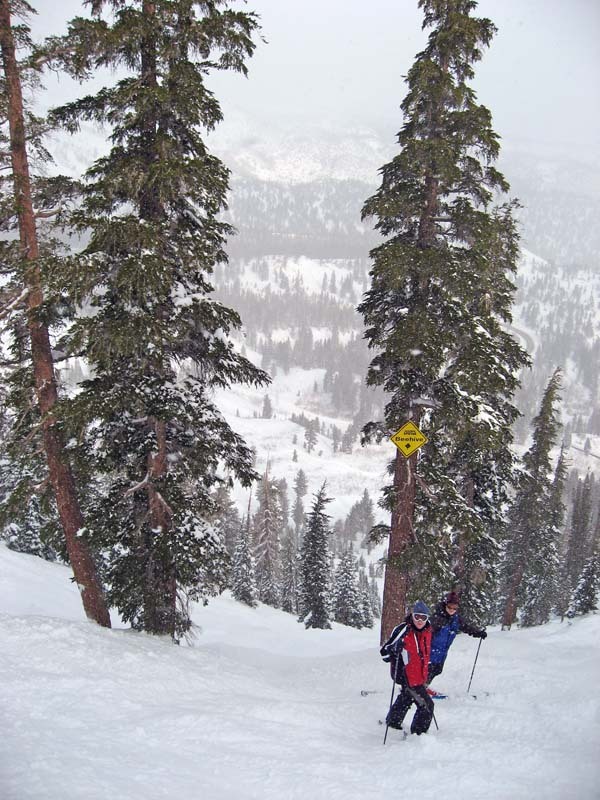 A picture of some very nice sparse trees we were skiing through with big fluffy powder. That's Brady on the far left of the picture. 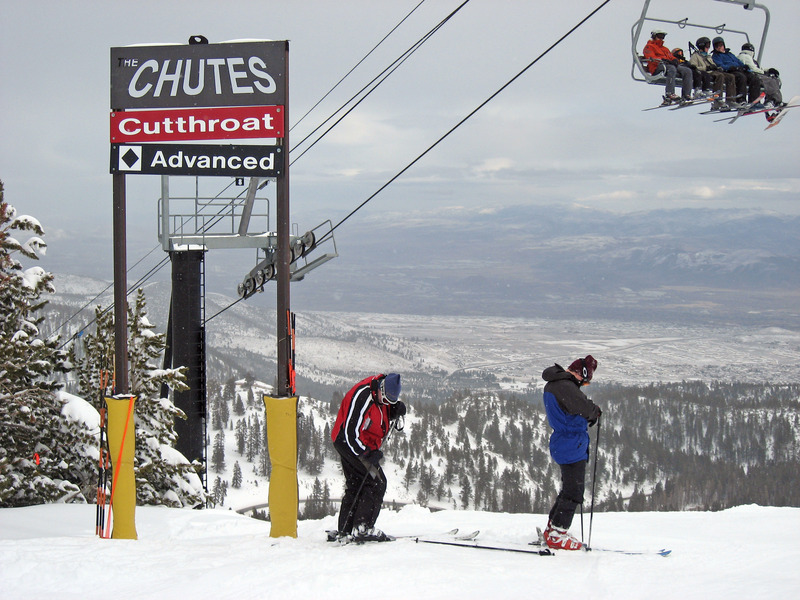 Brian and Brady get ready to ski down "Cutthroat", one of the Mt Rose chutes. As we broke for lunch, it started pelting down more snow. Here we are heading back out after lunch in the storm. 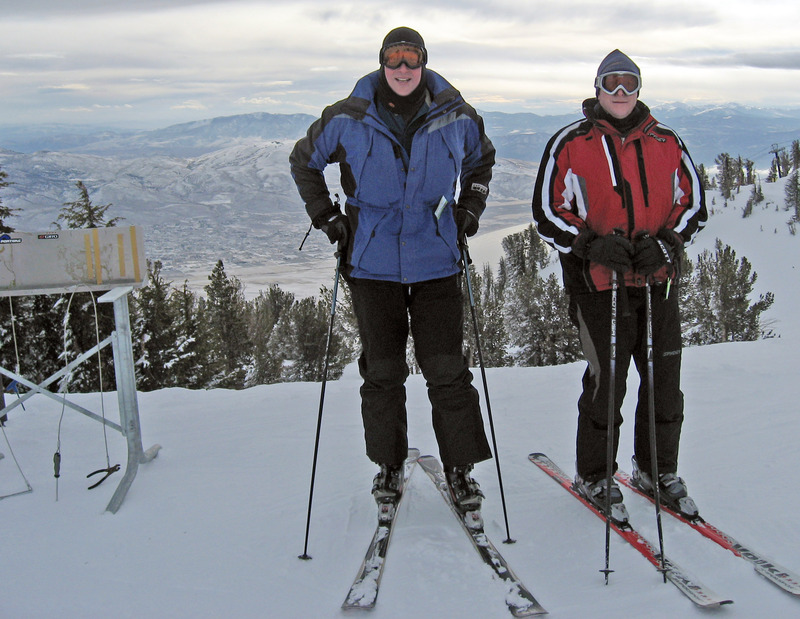 Brady and Brian Wohletz decided to ski a few double black diamond chutes. 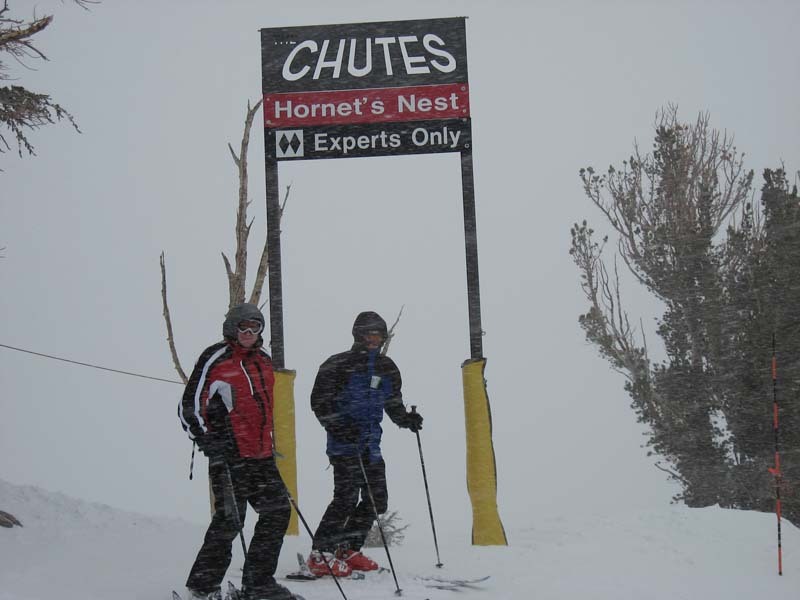 Here they are entering the "Hornet's Nest" Chute at Mt Rose. A close up of the same picture as above showing the snow whistling by in the wind. 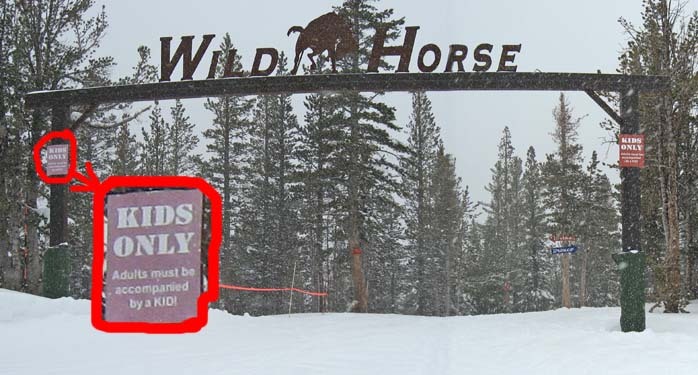 For myself, instead of doing the amazing double black diamond chutes in deep powder that could be remembered for a lifetime, I skied through the children's area. :-) Below is the entrance with the sign saying "KIDS ONLY: Adults must be accompanied by a KID!" 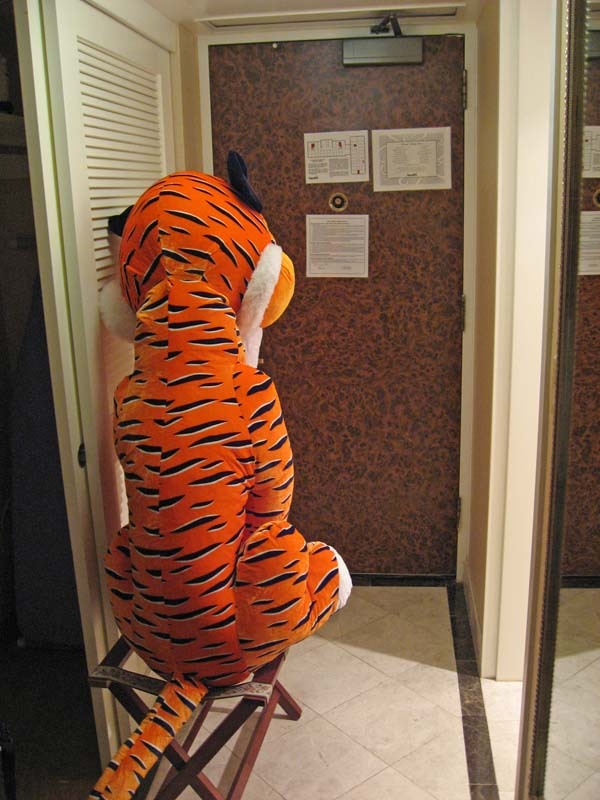 That night, I went to to the Circus Circus casino in Reno and while my friends gambled I played the carnival games and won the tiger pictured below in a "ring toss" game (one ring over one coke bottle won the tiger). 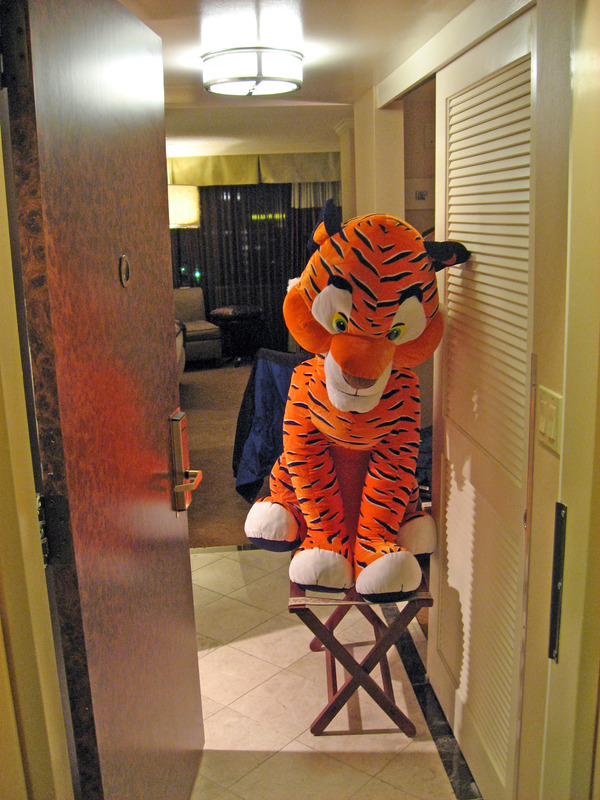 We set up the tiger to guard our hotel room door below. Here is what you would see if you opened our hotel room door.